We want the MasterWatt Lite Series to be that simple. Dual Forward and double EMI filter design elaborate the higher qualityDual Forward and double EMI filter design elaborate the higher quality. Advanced Circuit Design. For increased performance,MasterWatt is equipped with 16 AWG power cables,which reduces resistance,thereby increasing efficiency. MasterWatt Operates at 0dB under 15% load. Experience noise-free basic computing. 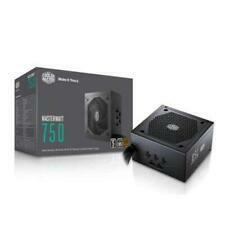 Cooler Master RS-500-PCAR-D3 Extreme Power Plus 500W ATX Power Supply. Condition is Used. Shipped with USPS Priority Mail. Cool Master Power Pro 1000W RS-A00-EMBA. Condition is used but everything works great. Included are the always required SATA cables and a just in case IDE cable for your legacy hardware. Cooler Master Silent Pro 700W 80 PSU Modular RS-700-AMBA-D3 700W. Condition is Used. Shipped with USPS Priority Mail. It's the perfect option for users and applications that don't require 80 Plus efficiency to get the job done. It only reflects the unit's ability to move power from the wall to your components. The higher heat resistance also reduces temperature based wear, increasing the lifespan of the unit by a noticeable amount. This Cooler Master Silent Pro M2 1500w 80 Silver has been very gently used and is in excellent condition. It has been recently tested and is fully functional. 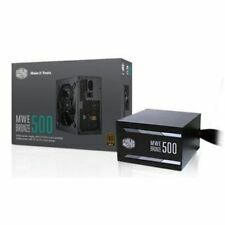 Cooler Master GX - 450, 450W Power Supply Black. Condition is Used. Shipped with USPS Priority Mail. This is a 450 watt power supply. Comes with supply and harness only. 3 x SATA (not 9, as it says on the box). 1 x CPU12V 4 4-Pin. No Floppy 4-Pin. 2 x Peripheral 4-Pin (not 4, as it says on the box). MASTERBOX LITE 3. MasterBox Lite 3. Challenge the confines of the MasterBox Lite 3 by utilizing its flexibility to free up space for larger components. Not everyone has space for a larger PC, but going small doesn't have to be a massive trade-off. The attached cords are the motherboard plugs and the other 3 are for 2 GPUs, and 1 cord with 3 plugs. Purchased this for my sons computer we were building but it was not the right size. Never been used. Cooler Master RS-A00-AMBA-J3 1000W Silent PRO Active PFC 80 Plus Bronze PSU. Condition is Used. No original box. Let me know what plugs you need. Dual Forward and double EMI filter design elaborate the higher quality Dual Forward and double EMI filter design elaborate the higher quality. We want the Master Watt Lite Series to be that simple. Advanced Circuit Design. Cooler Master's family of power options features a line of stable, high quality, 80 Plus Bronze power supplies. The MWE Bronze series is compact and available in outputs suitable for most systems. On top of safety regulations, the MWE Bronze includes Cooler Master's 3 year warranty. Cooler Master G750m Power Supply. Condition is New. Shipped with USPS Priority Mail. Used Cooler Master PSU. Works as it should. Free shipping! ATX 12V V2.4. 16ms at 80% load. 85% at Typical Load. CPU 12V 4 4 Pin : 1. Power Good Signal. ErP 2013 Lot 6. Item Condition: NewMPN. OCP / OVP / UVP / OPP / OTP / SCP. Designed to power select computers; 750W continuous power; ATX12V 2.31 compliance; 80 PLUS Gold certified; modular; 90% efficiency; 120mm fan; DC-DC technology. ATX12V 2.31 compliance. 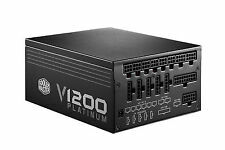 Specification Compliance: ATX12V 2.31. 75% efficiency - Maintains an average efficiency of 75% at 50% load. Alimentatore G550M 550W PSU 80Plus Bronze Semi Modulare. Condition is New. Shipped with USPS Priority Mail. Single 12V rail for superior load balancing and VGA compatibility. 80 Plus bronze certified. Local Pick-Up: Can be arranged if requested. We want the MasterWatt Lite Series to be that simple. Product Line MasterWatt Lite. Manufacturer Cooler Master Co., Ltd. Manufacturers change colors and item details frequently and often do not update pictures. PFC Active PFC >0.9. Output Capacity 1000W. Fan 135mm ultra silent fan. •Flat modularized cables to eliminate the clutter and improve airflow inside the chassis. •Unique silicon pad eliminate the vibration. MWE Bronze 500. 16ms at 80% load. 1 x CPU 12V 4 4 Pin. Power Good Signal. ErP 2013 Lot 6. Item Condition: NewMPN. Fan Bearing. 1 x MB 20 4 Pin. Series: MWE 600 Bronze. The sleeved cables reduce clutter and increase airflow, leading to better aesthetics and thermal performance. The Silencio fan and sealed LDB bearings ensure quiet cooling. 80 PLUS Bronze certified. Active Power Factor Correction 90%. Cooler Master RS650-AMAAB1-US. AC Input Power 100 to 240 VAC, 50 / 60 Hz at 5 to 10 A. Condition: New Factory Sealed. Power-Good Signal 100 to 500 ms. 6 x 4-Pin Peripheral / Molex. Carefully pulled from a good working system. Real Power Pro 850W. No issues to speak of, was pulled from my PC during a recent overhaul in good working condition. Cooler Master. Series: Masterwatt Lite. Advanced Circuit Design - Active PFC PWM combined with dual forward topology and double EMI filter enhances power output efficiency and increases the stability of your system.